The Alexander Turnbull Library is not an art gallery: but it does hold the largest and most important collection of historical New Zealand paintings, drawings and prints in the world. There is also much Pacific material of this nature. The collection belongs to the people of New Zealand - for reference, for research, for refreshment. This watercolour is from the collection of 250, bequeathed in 1926 by the artist's son, W.F. Barraud. The Barraud Collection now totals over three hundred watercolours, some of which (including some owned by Mr Turnbull) are the originals or duplicates of plates in New Zealand: Graphic and Descriptive (London, 1877). In a few instances the Library holds sketches made in the field as well as studio works from them - the former invariably being superior. In 1956 the late John Barraud Blundell donated a most useful collection of sketchbooks and manuscripts of his grandfather's work. At present, the last function is limited to the changing displays in the exhibition area of 44 The Terrace, Wellington, and to the few choice oil paintings permanently on show in the reading room. As well, the library lends items for exhibitions arranged by other institutions. However, the Turnbull Library is to occupy a substantial space in the National Library to be built in Molesworth Street; and when that happens there will be more exhibition areas and a gallery where, under carefully-controlled physical conditions, early watercolours and other works will be freely seen. This gallery will provide exhibition conditions unequalled in New Zealand. ink drawing, 82 x 170mm. 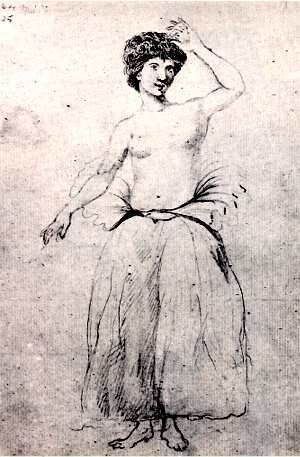 (from a sketchbook, 1839-1865). How big is the collection? And who started it? And with what policy are acquisitions made? These are some questions which the public has a right to ask. There are 200 oil paintings; 18,000 original watercolours and drawing some in sketchbooks; and 9,000 etching and engravings, lithographs, architectural plans and 6,000 printed reproductions. This last category includes posters and calendars, cards an exhibition catalogues and notices - those easily-lost documents of daily activity. Not all the items in the art collection are works of art: but they all tell our history. Whatever their aesthetic value. they show the artefacts and buildings an people, the customs and taste of New Zealanders in each decade. E.A. Williams was perhaps the most accomplished of New Zealand's numerous military artists. 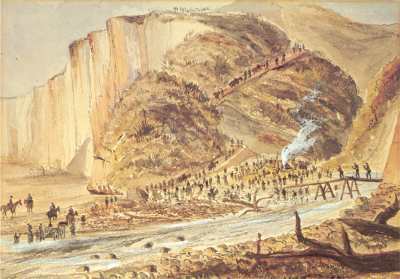 This was one of four paintings of the Wanganui area (when he was commanding officer of the 4th Brigade, Royal Artillery) which were purchased at auction locally by the Endowment Trust in 1973, to add to the eight watercolours by Williams already held. The library's founder began the a collection in 1889 and 1890 when h approached E.W. Payton, the first principal of Elam School of Fine Arts in Auckland, to purchase his published etchings of New Zealand scenery; and Mrs G.B. Hetley, whose book had just been published in London, for the drawings of native flowers. In 1895 Turnbull set going a comprehensive collection of engravings illustrative of Pacific exploration: and particularly of Cook's voyages, with four Cleveley aquatints. The first oil painting bought was a large portrait of Samuel Marsden done by Joseph Backler from a watercolour by another Australian Richard Read. In 1912, Alexander Turnbull started to build what subsequently has become another remarkable holding (now our largest of paintings by any single artist) when he accepted a watercolour which William Fox had made in 1843 of his house in Hill Street, on part of the present site of Parliament Buildings. Three years later he bought a now priceless collection of one hundred paintings and drawings for the then considerable sum of £585. Made for the New Zealand Company in the 1840s, it included fifty works by Charles Heaphy; twenty of William Fox's finest watercolours; watercolours and ink drawings by William Mein Smith; pencil drawings of C.H. Kettle: all artists who worked for the New Zealand Company. When Turnbull bought them, all the works were in mint condition. They had been carefully stored and had never been exposed to light or dirt. The luminous rich colours which these paintings still have are the most cogent argument for the kind of care watercolours are given by the Library - they should still look as fresh in another hundred years. pen and ink,228 x 156mm. The Ellis Collection was purchased from a dealer in London in 1977, with the aid of grants from the Lottery Board of Control, the T.G. Macarthy Trust and D.G. Medway Esq., New Plymouth. Special articles in the Turnbull Library Record (October 1977) describe in detail the 131 drawings of the Collection and deal with their great scientific and historical importance. Ellis was assistant surgeon on Cook's Third Voyage; and although fine watercolours are held in the British Museum (Natural History), the Rex Nan Kivell Collection in Canberra and the Bernice P. Bishop Museum in Honolulu, these are all finished paintings made after the voyage. The Turnbull's new collection consists entirely of hitherto unknown drawings made ad vivum during the voyage, ranging from' New Zealand right through the Pacific to Alaska and Kamchatka: hence their great research value, covering as they do landscapes, inhabitants, fauna and flora. The Ellis Collection is one of the major acquisitions of the Alexander Turnbull Library in its sixty years of State ownership. These purchases set an example of historically significant excellence. It is the standard to which all subsequent collecting has aspired. But an historical collection is not built primarily (as that of an art gallery must be) around aesthetic excellence. The touchstone for its acquisition is historical and topographical truth. 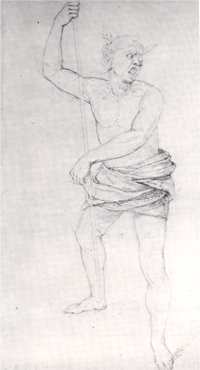 Here, awkward drawings in private sketchbooks are as important for research as, say, the small professional portraits in oil done by James Barry of the Maori chiefs who visited England in 1818, or the fine paintings by Augustus Earle of 'the meeting of the artist with the wounded chief Hongi' or the self-portrait by Samuel Butler. These, certainly, are among the highlights of the oil paintings. However, for a research collection highlights are not enough. The importance of such a collection is that it should range as widely as possible; that it should care for, and catalogue as carefully, the most tatty and inept drawing of a kumera pit or a pioneer's house or a military stockade, as the perceptive studies of a professional artist like William Strutt, or the finished watercolours of figures in landscape by J.A. Gilfillan or Frances Hodgkins. In 1913 Alexander Turnbull bought two large albums made up by Strutt, containing eighty-one New Zealand sketches by him, many being important studies of both colonial life and the Maori, of considerable value for research. 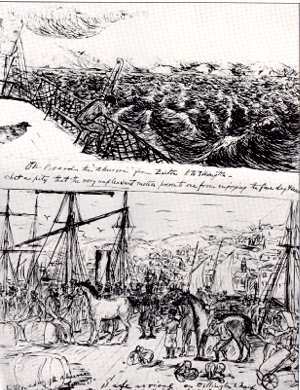 Strutt's diary of his sojourn in this country came with the albums and is in its own right a significant manuscript. Two Strutt oil paintings, both depicting New Plymouth landscapes, are among the finest oils in the library. All the works on paper are protected by inert plastic and housed between acid-free folders in book boxes or in steel filing cabinets. Because of a minimal exposure to light, the masterpieces of a watercolour tradition are being saved in a fresh condition for posterity. The oil paintings are housed in frames on sliding metal racks. Why, the public might ask, do we keep all these things 'buried in a library'? It is necessary to say that they are not 'buried'. The card catalogue, photographic reference files, all the methods of recall in the elaborate memory-bank of a research library are open to the research worker. 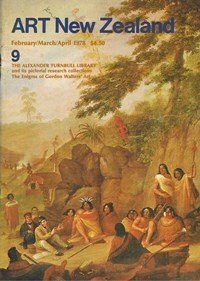 The Alexander Turnbull library is the intermediary between scholar and public. Its treasures reach out beyond New Zealand, in books and on film, by way of publication and television. School Publications use historical drawings to illustrate their Bulletins; publishers find the designs for dust-wrappers, authors their illustrations in the art collection. The non-professional comes with a reference question. . . Who painted this picture; what is its subject; who can prevent this foxing from spreading? What are the graphic records of Invercargill in the 1860s, of gold-mining in Coromandel, or Maori food storage? When did this painter arrive in New Zealand and when did that one emigrate or die? What information have you about Frederick Aloysius Weld; or who would have painted my watercolour of lake Taupo dated 186? and signed HSB? 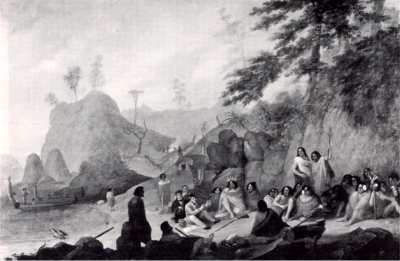 What New Zealand paintings were featured in the Colonial and Indian Exhibition of 1886 or the Centennial Exhibition of 1940? These are some of the questions which members of the public ask. oils on canvas, 58.5 x 87.5 mm. With the growth of interest in New Zealand's cultural history has come a new call on the art collection: the research undertaken by students of art history, in secondary schools, in polytechs and from universities all over the country. Now, the work of individual artists is being studied in depth: and the Turnbull library has large collections still to be worked on. For example, one of the most comprehensive collections is the published and unpublished work of the naturalist, William Swainson. There are boxes labelled 'Figures of Birds, Mammals, Mollusca, Insects', done for Lardner's Cabinet Cyclopaedia published in London from 1830-1840. William Swainson had been editor and chief illustrator of the twelve volume natural history section. When he emigrated to New Zealand, in 1840, he brought with him these boxes of drawings, lithographs and coloured engravings as well as monotone watercolours of Sicilian landscape done while he was on army service from 1806-1815. Swainson and his family lived for two years, in Thorndon while a house was built and cultivations prepared on leasehold land at the Hutt. 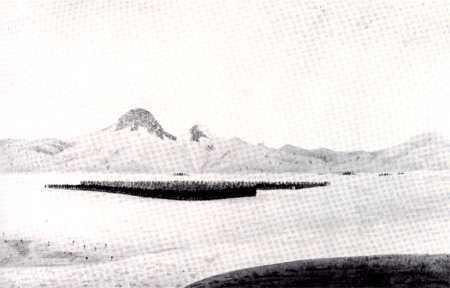 His drawings then recorded his new life: small pencil studies of Maori whares or the first settlers' houses on Petone beach, of the Hutt road, stockades, native trees. In 1851, when his hopes for financial success as a farmer were fading, he left to make a botanical survey of eucalypts for the New South Wales Government, followed by another for Victoria - still a valuable reference for Australian botanists. monchrome wash, 155 x 237 mm. Those with a scientific bent will find other unresearched, non-New Zealand treasures in the Godfrey Mantell bequest which includes the collections of his geologist grandfather, Gideon Mantell; in the watercolours of an American entomologist, John Abbot, or the magnificent volume of Australian bird paintings done by George Raper and others in the 1790s. 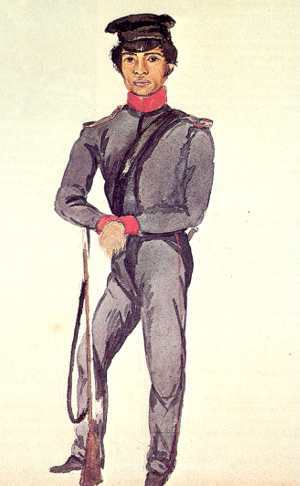 Among a wealth of sketchbook material are the quick, free, pencil drawings of men as diverse as the' missionary Richard Taylor, the traveller George French Angas, and a lovingly-compiled album of watercolours, which her friends gave to Mrs Hobson when she left New Zealand after her husband's early death. All these give pictures of Maori life before the destructive force of European ways. oil on canvas, 495 x 392 mm. Considered by many to be the finest of Fristrom's few Maori portraits, this appears to have been purchased by Alexander Turnbull when it was first exhibited. In 1899 he had declined a Lindauer of Harawia Te Makokai offered at £55; and in 1918 he wrote to a London dealer rejecting another Lindauer Maori portrait: 'I do not care to purchase any of this artist's work. They are really coloured photographs, and of little, if any, artistic value. Over the past half-century extensive purchases have added depth to areas of Turnbull's original collection. In his area of Pacific interest, notable recent additions are the Chazal watercolours and proofs of the engravings which illustrate the published accounts of Duperrey's expedition, 1822-25; the drawings from Cook's third voyage by William Ellis; and a red chalk drawing. 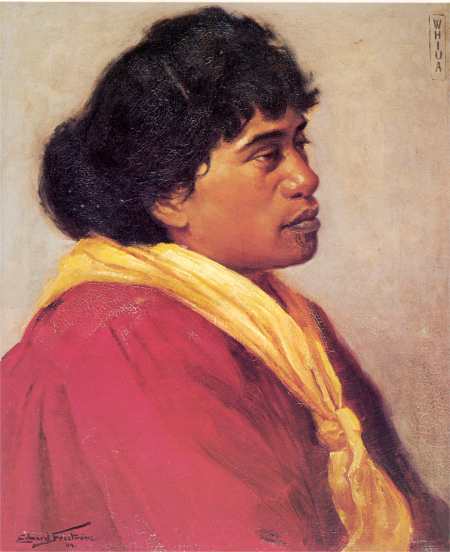 'A Man of Tanna' by William Hodges. Special government grants made possible the acquisition of the Chazal and Ellis works, 337 watercolours by William Fox and five watercolours by G.F. Angas. Twelve large watercolours of the Southern Alps glaciers by John Gully were purchased by the Endowment Trust. Works by military artists, the colonels E.A. Williams, Henry James Warre, Cyprian Bridge, William Anson McCleverty, Charles Emilius Gold and Horatio Robley have greatly expanded graphic records in a field which had already been opened up in Turnbull's original collection. Donation has always been a source of unexpected riches. large collections of C.D. Barraud and S.M. Moreton were given in the early stages by descendants; and, still, descendants bring in treasures which they think too valuable to be left in private hands. Three miniatures by J.A. Gilfillan have been donated this past year and the collection has been gratifyingly strengthened by, for example, the generous deposit from the Scrope family of their paintings by Sir Frederick Weld, and by a magnificent gift from the Hodgkins family of nearly 200 watercolours by William Hodgkins. Single items shine like beacons: the Beetham portrait of Mein Smith from his grand-daughter, for example. By all these things are we, as a people, enriched. Janet Paul worked as a publisher and a typographer with her husband Blackwood Paul from 1945 to 1965, and is now Art Librarian, Alexander Turnbull Library. Janet Paul is also a painter.